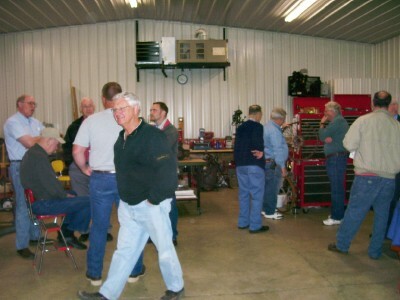 The February meeting was held at Jack Putnam's. The treasurers report was given by Jack Putnam. We had a total of 12 members and guests present. Elections were held for president, vice president, secretary, and treasurer. We talked about the big celebration that is to happen in July of 2008 over around Richmond, Indiana. Some of the members are planning on attending. Some of us are thinking about traveling to Greenville, Ohio and traveling the area outside of the "official" celebration. We all plan to have fun, no matter how we go about it. The count for the celebration is already up to around 750 cars. This winter has seen a lot of snow and rain. We just missed the deepest snow this last week and the storms last month brought water up to Jack's lower shed. I'll bet Bob Hollister's law office came close to flooding again. 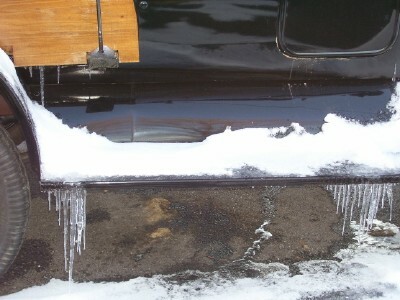 There have been a number of occasions when "Old Henry" had to set out this winter. Its quite a sight to see the old car covered with snow. Thank you to the members that attended the Ritz Players production of Grease. Anyone who has forgotten dues this year, please remember that they are due at the first of the year. Also, you must keep up your dues to the MTFCA and the MTFCI to continue to receive their publications. 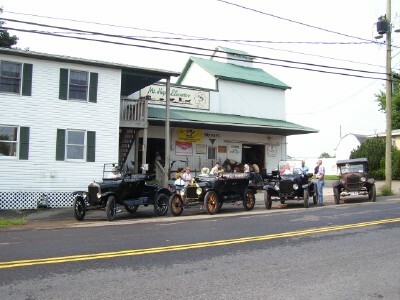 The Ohio River Valley T's called and said that their club would host the 2008 All Ohio Model T Jamboree with the help of the Southern Ohio Ford Club. It will be centered in Jackson, Ohio. 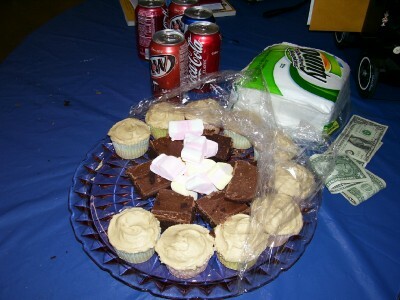 The goodies that Marilyn prepares for the gang every month are great for the sweet tooth. There is somthing new every month. We are the best fed group around. Just remember to bring your favorite soda to keep the refrigerator stocked. The chance to hear a Model T engine run. 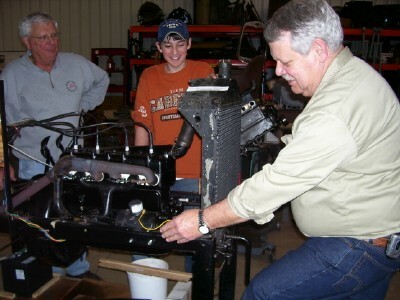 Jack is always working on someone's Model T engine. There is always an engine on the stand just ready to start. With engines coming in and leaving all of the time, it is just a great place to see the innards of the Model T engine. The story telling after the meeting. Some of the fellows like to talk about Model T's that they once owned or have worked on. The meeting with other owners is a wonderful place to swap stories about their favorite car (the Ford Model T.
The chance to see variations on a Model T theme. We get to see all of the ways that people are trying to make the Model T a better running machine. We also get to see things that are not such good ideas. There have been a lot of ideas built around all of those car engines and bodies. We enjoy working on little projects were we all learn something about some aspect of the Ford Model T. This is experience that none of us could amass by ourselves. As a group we are much the wiser if we pay attention to everything that is going on at the meetings. 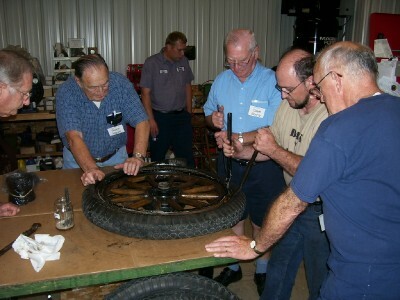 The members learn about upcoming tours and happenings in the Model T community. We have hosted a couple of Annual Ohio Model T Jamborees and many of our club members are active in all sorts of local events. Lost Relic Brought Back to Life as "Greased Lightening"
Here is a before and after photo of the 1954 Plymouth that Randy Halen and myself converted into Greased Lightening for the stage play "Grease". The trick was to shrink the car form 79 inches to 66 inches wide to get it into the theater and onto stage. The first step was to get it out of the woods and into a shop. Joe Bell donated the facilities and a local scrap yard donated the tires and some metal. The hood was straightened. All of the doors were chopped to create the convertible look. Three of the four doors were welded shut. The front fenders were set to the proper width. 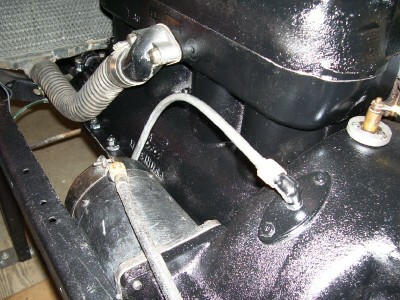 The hood was welded in place and cut to flow into the fenders. The windshield and dash were left at the their full width to get the desired affect. From the audience it looked like a gem. 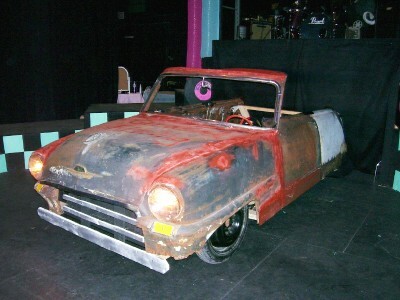 The car is never fixed up in the stage play like it is in the movie. With all of the moving of sets and music stores, Old Henry (our 1916 touring/truck) has had to sit out in the cold on a number of occasions. Here we see the afternoon after last week's snow storms. 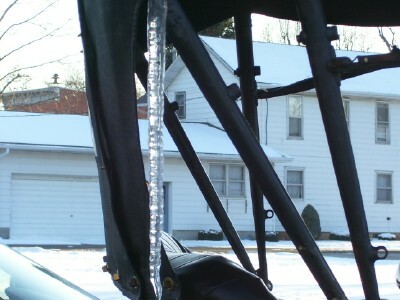 The icicle hanging off the top was over two feet long. 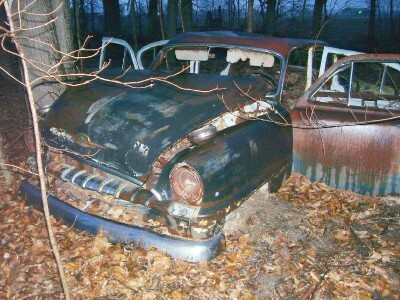 I realize that some will wonder what kind of nut case would let his old car sit outside. Well, I'm the type that believes that the cars were meant to be exposed to this kind of weather. Any needed restoration as the result of this abuse will just be part of the ongoing life of the cars. They've made it this long and I expect that they will survive to tour another day. I did have "Old Henry" in the trailer for the weekend 12+" storm. 1. Jay Leno has purchased a 1925 Model T Roadster. As most people know, Jay is a collector of many big and fancy cars. he shows his cars at some of the big shows on the west coast. He has been bitten by the Model T bug and has been driving the roadster into work. The Model T, with its big tires, is doing very well on the pot hole ridden streets of Southern California. If the craze catches on, the value of a Model T may climb in more than scrap value!!!!! 2. The Ford Motor Company has decided to be a sponsor for the Model T anniversary celebration put on by the MTFCA. Who knows what exactly the sponsorship will entail. I'm sure that Ford banners will be everywhere and they may even bring a bunch of modern cars to display at the fairgrounds. It is just nice to know that Ford still recognizes the Model T as a Ford product and is willing to acknowledge the fact that it is part of their heritage. Now if they would just acknowledge the fact that we are free advertising every time that we tour.